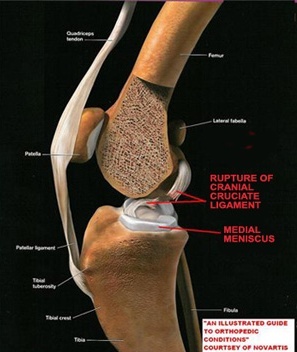 The Cranial Cruciate Ligament (a.k.a. Anterior Cruciate Ligament in human anatomic terms) is a cable-like structure that connects the Femur (upper long bone of the hind limb) with the Tibia (lower long bone of the hind limb) and is located within the stifle (knee) joint. The function of the CCL is to resist Cranial Tibial Thrust (the forward movement of the tibia relative to the femur). Injury to the CCL is one of the most common orthopedic injuries in dogs and cats, and can be caused in many ways. 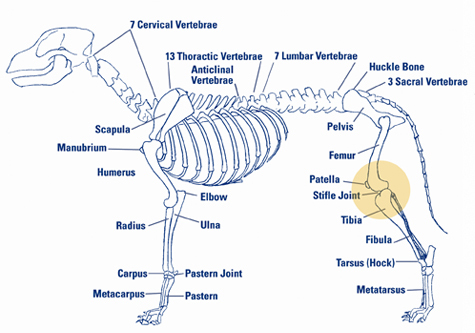 Some dogs have an anatomic defect that make them prone to CCL injury, and this commonly occurs when they are young. Other dogs can sustain CCL tear as a result of accidental trauma. Ongoing inflammation within the stifle joint for whatever reason can result in a “Sick CCL” which ultimately fails. This last category is particularly common in older, overweight dogs, dogs with other stifle defects, and some breeds like Cocker Spaniels. Partial tears inevitably progress to complete tears as the CCL has very poor healing capability. Small dogs (less than 10 lbs.) and cats can sometimes get along relatively well without repair, but for most other CCL injuries, surgical stabilization is necessary to re-establish normal gait and activity. Patients are hospitalized the night of surgery and generally go home the next day with the operated leg bandaged, antibiotics and pain control med's. At four, eight and twelve days post-op we see the patient for evaluation and to administer an injectable joint-recovery medication, AdequanR. We recommend restricted activity, confinement to a small, clean, dry area and hand walking on a leash to go outside during the first two weeks. The bandage can remain in place as long as it stays clean and dry, usually 5 to 7 days, and we Torn ligament post-op care for dogsdo not usually replace it to avoid “bandage burn” irritation from bandage adhesive. Appropriate measures to keep the patient from traumatizing the surgical area is often needed once the bandage is removed. Sutures are usually removed at 14 days post-op, then begins the next phase of recovery. To encourage optimal healing we advocate physical therapy measures designed to promote strength of the repair and maintain normal “range of motion” of the stifle joint. We instruct clients in “dynamic healing techniques: measured, low-impact exercise and passive range of motion limb manipulations. For clients desiring the best in recovery measures, or patients with special needs, we provide referrals to certified physical therapy experts. Patients are usually weight-bearing at the time of suture removal and have good use of the limb at 60 days post-op. We consider this a crucial time in the recovery period because the patient feels good enough to resume full activity but can suffer setbacks in healing with over-exertion such as all-out sprinting and/or jumping. From two to six months we advise reasonable exercise, on leash if needed, avoiding high-impact activities. By six months the healing process is mature and the repair is as strong as it will be. Return to full function depends upon many factors, but in most case is compromised by coincidental injury, such as a torn meniscus, or advanced degenerative joint disease as a pre-existing condition. We advise ongoing anti-inflammatory medication and joint supplements or pharmaceuticals to discourage the development of arthritis which is inevitable with severe joint injury. Our failure rate for CCL repair is very low and has been associated primarily with inappropriate exertion early in the recovery phase. We have seen one case of premature failure of the stabilization suture that was repaired at no cost to the client. 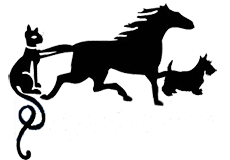 A certain percentage of patients, particularly those predisposed to CCL injury, will go on to injure the other hind limb within 12 to 24 months of the initial injury. Ongoing anti-inflammatory meds and joint supplements or pharmaceuticals also help to prevent this second CCL injury. There are many ways to attempt stabilization of the stifle in the face of a torn CCL, a situation that is due to weaknesses or failure associated with many procedures. Our approach incorporates multiple stabilization elements combined as appropriate as an Extra-Capsular technique. Essentially, our surgery creates a brace underneath the skin, but outside of the joint capsule, initially of monofilament nylon (manufactured specifically for this surgical technique), which ultimately relies on the dog’s own production of scar tissue to counteract cranial tibial thrust. The monofilament implants remain in place for years, providing additional strength and stability long after stabilizing scar tissue has formed. We have chosen this technique due to it’s nearly universal applicability, it’s minimal invasiveness and rapid recovery (as compared to techniques requiring cutting or repositioning bone), it’s low failure rate over years of service, it’s relatively low cost (also as compared to more invasive procedures), and our extensive experience in applying appropriate stabilization elements depending on the needs of the individual patient (as determined by our work-up and at the time of surgery). Variations of extra-capsular techniques are used commonly in the face of failure of more invasive procedures, and have been shown to be every bit as effective in stifle stabilization, as measured by weight-bearing assessment and arresting the development of arthritis, as procedures such as the Tibial Plateau Leveling Osteotomy (TPLO). The surgical procedure generally takes between 40 and 80 minutes depending on the specific damage and patient considerations. We choose an appropriate anesthetic protocol tailored to the patient, based on existing health concerns and pre-anesthetic diagnostic evaluation, also tailored to the individual. Infection and pain control are major priorities before, during and after surgery. Initial injury is very painful, regardless whether it is a sprain, partial tear or complete tear. Dogs and cats are usually non-weight bearing and painful to physical manipulation of the knee, particularly when trying to assess “Cranial Drawer Sign”. This manipulation involves holding the end of the femur in one hand and pulling the adjacent tibial end forward. Dogs are also reluctant to sit with their hind legs directly under them, so they will either sit sideways on the affected leg or extend it out away from the body while sitting sideways on the unaffected leg (positive sit test). With mild to moderate injury (less than complete tear), particularly if it occurred more than two weeks before assessment, localizing damage to the CCL can be difficult in an un-sedated animal. Once a suspicion of CCL injury is determined, or relaxation is needed for accurate assessment, the next step is to sedate the animal and radiograph the pelvis and hind limbs. Sedation eliminates the conscious muscular resistance and pain for cranial drawer assessment. Radiographic information helps to find incidental problems (such as bad hips, tipped tibial plateaus or advanced arthritis), determine the appropriate surgical procedures, estimate the prognosis for hind limb function after repair and the likelihood of future CCL injury to the unaffected leg. "If only men could love each other like dogs, the world would be paradise."